Using framing elements is one of the mechanisms we can use as a photographer to direct the viewer’s eye very visually. While most Dallas bridal portraits take place in the same common locations, we attract brides who are looking for something different. By using an interior location and lighting the scene from the right, we put this bride in a pose that gave her a reason to be in the light and yet still well composed within the frame. Including the candelabra gave depth to the image as well as provided a sense of opulence. Many aspiring photographers will try to use propping elements within their photography, but few do it well. The advent of Pinterest causes the average bride to believe that more is better which of course it isn't. Great photography is about removing all distractions that don't contribute to the storytelling aspect of the portrait. 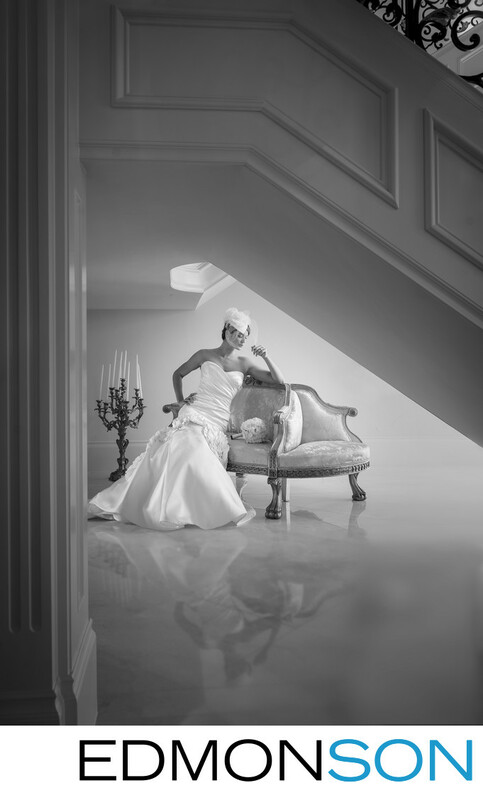 While the obvious shot here is to place the bride on the stairs, the voyeuristic perspective that was used presents the bride in a much more interesting manner. 1/60; f/5.0; ISO 400; 31.0 mm.